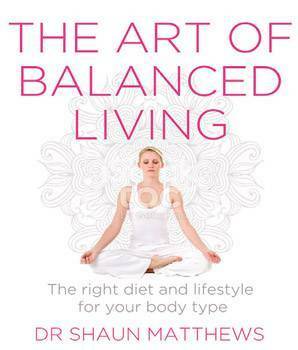 The Art of Balanced Living introduces the body-type diet of the ancient Indian Ayurveda tradition and shows how it can help us live healthier, happier and more balanced lives today. The advice in The Art of Balanced Living is designed to help you sustain wellbeing and overcome stressful times and events. It based on the body-typing system of Ayurveda, India's traditional system of healing. Elements of Ayurveda are well known around the world, for example, yoga and medita¬tion. However, until now, only a select few have known about the body type diet and how it affects our physical, emotional and mental health. The three body types, or doshas, are: Vata, Pitta and Kapha. They reflect and affect everything from the health of our skin to the state of our finances. At the physical level, our body type has a bearing on how we walk, our skin type, the weather we enjoy and how our digestion functions. At the emotional level, body type has a bearing on how we react to people and situations, resolve conflict and deal with stress. At the mental level, it affects how we approach tasks and process new information. Why is it that I can't shift that last 5 kilos of weight? Why is digestion so sensitive to raw food, creating excessive wind and bloating? Why do I get angry so quickly when others seem so relaxed? Why can't I tolerate hot spices while others seem to thrive on them? The Art of Balanced Living explores all this and more, from maintaining a strong immune system to meditation and yoga, the healing power of herbs and the secrets of eternal youth. It also contains recipes and personal stories from people whose lives have changed after implementing the body-type diet. VATA types tend to be thin and lose weight when stressed. They are attract¬ed to creative fields. Their challenge is not to take on too many things, which can lead to that 'running on empty" feeling. PITTA types tend to have a medium build and a constant weight. They are productive, dynamic, hardworking and focus well on tasks. Their chal¬lenge is not to over-focus, which can lead to burnout. KAPHA types tend to have a heavy build and put on weight easily. They have good stamina and a calm, easy going disposition. They don't mind repetitive tasks. Their challenge is to stay mentally stimulated and physically active, otherwise they feel 'stuck in a rut". Dr Shaun Matthews trained in medicine in Ireland and Australia, and has worked as a general practi¬tioner since 1992. He studied Ayurvedic medicine in India at Gujarat Ayurveda University and trained as Yoga teacher at the Bihar School of Yoga. Shaun was an associate lecturer in the School of Public Health and Community Medicine at the University of New South Wales from 1992–2005. In 1997 he founded the Department of Ayurvedic Medicine at Nature Care College in Sydney where he still lec¬tures. He is the author of Journeys in Healing – how others have triumphed over disease and disability. Shaun is in private practice in Sydney. His website is www.ayurvedichealing.com.au. Question: How can we determine our body type? Dr Shaun Matthews: I have devised a short quiz, available in my book, which can help people determine their body type. Your Ayurvedic body type expresses your physical, emotional and mental tendencies. In Ayurveda, the traditional system of healing in India, there are three basic body types – Vata (wind), Pitta (fire) and Kapha (earth). People with a Vata body type tend to have a light build, feel the cold, are more highly strung and have creative minds. They are more prone to worry. People with a Pitta body type tend to have a medium build, are competitive by nature and have analytical minds. They are prone to anger and frustration. People with a Kapha body type tend to have a heavy build, are calm and easy going by nature and have methodical minds. They are prone to melancholia and feeling 'stuck in a rut". Question: How should our body type control our diet and lifestyle? Dr Shaun Matthews: Through being mindful of our body type we can create for ourselves a diet and lifestyle that keeps us balanced – feeling relaxed but at the same time energetic. For example, Pitta types are prone to over-heating and will become irritable and angry, so a cooling diet with salads and fresh fruit keeps them balanced. Question: Can you talk us through how different body types react to stress? Dr Shaun Matthews: Vata types when stressed become agitated, anxious and forgetful. They may lose weight and have trouble sleeping. Pitta types when stressed become fiery, critical and argumentative. They may experience heartburn and skin rashes. Kapha types when stressed become lethargic and apathetic. They may put on weight, experience fluid retention or have build up of mucus in their chest and sinuses. Question: What are the benefits of eating for our body type? Dr Shaun Matthews: It keeps you balanced physically, emotionally and mentally. You feel relaxed, you maintain your weight and you have plenty of energy in reserve. Your immune system functions optimally and wellbeing in mind and body is much more likely. Question: Is a certain body type more likely to hold weight? Dr Shaun Matthews: Yes, Kapha types are the most prone to comfort eating and can put on weight easily, as they have a slower metabolism. It is hard for them to lose weight.